I couldn't stop turning the pages! 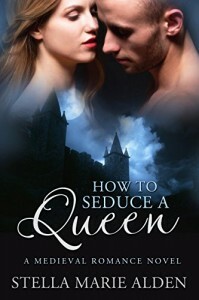 This book had a VERY interesting plot (and quite a plot); pretend to be a monk, seduce the queen, produce an heir. Easy, right? The twists and turns that came along with this had me eagerly turning the pages to see what would happen next and how the Happily Ever After would play out. I liked Fay. She was a strong heroine who didn't take any nonsense from the men around her, even though it was socially expected that she just curtsey and say, "Yes, sir. Whatever you say, sir." Nicholas was not as clear in his convictions. He didn't know if he should follow his heart or follow the instructions of the man to whom he swore allegiance. The final conflict of the story was quite unexpected, and I could think of no better way to unite this couple than the way Stella wrote! I can't wait to see what adventures Stella writes next!